Team Ico's anticipated action/adventure is still alive and mysterious. A three-year development cycle is not unheard of for a game, especially a game as hotly anticipated as Team Ico's The Last Guardian. However, when three years go by with nary a new screenshot, fans begin to suspect that something is up. Sony jumped to stifle rumors of the game's cancellation, but its conspicuous absence at the Tokyo Game Show left some media outlets wondering whether the game was really still underway. 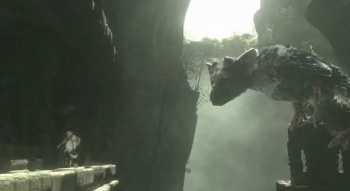 Sony confirmed that The Last Guardian is still very much alive, but wonders if 2009 was too soon to introduce it to the world. A developer of The Last Guardian who wished to remain anonymous shared some information at TGS regarding the game's lack of presence on the show floor. "I give you my word that it exists," he said. In spite of rumors that the game might have transitioned from a late PS3 to an early PS4 title and director Fumito Ueda's departure from Sony, the developer maintained that The Last Guardian's progress might be slow, but it was steady. "[It's a] very ambitious project," he continued, admitting that Sony may have jumped the gun by announcing the game too early in its development cycle. Given all of the drama that has surrounded its development and (hopefully) eventual release, one more oddity for The Last Guardian hardly seems out of place. Although Team Ico has dragged its heels in the past, it's been relatively good to its word in the long run. The game might not be out anytime soon, but there's not quite enough evidence to pronounce it missing in action just yet.